Now when you spend some days in Shanghai and you love tea, then there is one place you should not miss: Tian Shan Tea City! 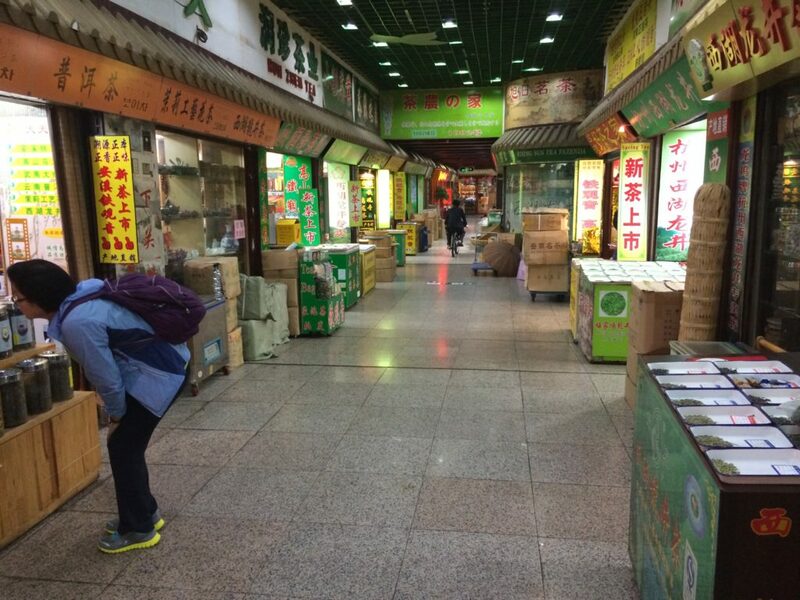 It is pretty much something what you can call a “tea mall” or a “tea shopping centre”. I was lucky that I received a tip from a friend about this place.I was also lucky that this place was within walking distance from my Shanghai accommodation. So while I was walking down the road towards this tea temple my heart started pounding full of excitement about the many teas and tea wares I was about to see. I was about to see my personal tea mekka place. And it really was amazing. From far away I could already see the building appear in the distance. Also the landscape of the shops close by to it changed. The many food shops around got less and less and more and more shops with tea cakes and Yixing pots in their windows would appear. Tian Shan really seems to be the tea district of Shanghai. It took me a while to find the entrance and when I found it and entered the mall, then the first thing I thought was “wow, this looks like a bazaar in here”. I was at ground level of the four storey building and what I saw were long stretched corridors with many small shops standing right next to each other. Some had some tables standing outside with tea leaves on display, others had all their tea treasures only on display inside of their little domicile. Basically all of the four storeys would look like this. Its not that you could actually get lost, the floorplans are all straight forward and you would easily find back to the lifts and staircases, but because all the corridors look alike, it could happen that you will have some difficulties finding back to a particular store. Especially if you become tea drunk from all the different teas you are being offered and are in consequence very low on electrolytes and need to go to the bathroom and then get back to the retailer, you could be confronted with the problem of not finding your back. If I am not mistaken, then there is a total of 150 stores within this complex – its huuuge. Now when you take a look at the upper picture you might notice that there is not really much going on. The general look of it seems like a bazaar, but where is this hustle and bustle that is so characteristic for such places? Yes, this surprised me too. I was actually one of the few visitors to TianShan tea city on that day. It was a week day and at around 12 pm. Not a very busy time for TianShan as I was told later. Business would increase later the day and on the weekend off course. But what I also learned was, that this place never presents itself as an exciting place with loads of people everywhere who loudly bargain over tea. Actually tea tourists like me and similar non tea wholesalers kinda folks are not to be seen very often under this roof. It is definitely not a tourist attraction and this has several reasons. One of them is, that the main purpose of these many little shops is not to sell tea to people that drop by occasionally, its more that these little shops serve as tea offices. The real tea deals happen online and the shop serves as the place where the buyer and the seller can meet and shake their hands on deals. I was passing by many shops and the owner would sit in the back and be on his laptop, either making money or killing his boredom. I was also noticing people in business suits sitting in shops, counting many notes of money, placing those bundles on the counter afterwards to then slide it over to the other side of the table to the shop owner. The other reason of it not being listed in any lonely planet is, that you are pretty much lost in there without any Mandarin skills. 95% of the people would only speak Mandarin and only have some very little knowledge of English. While walking around I was getting looks from inside the shops and I reckon boredom and interest in this Western looking guy, who obviously took a wrong turn at some point in the city, accounted for that. But I enjoyed it to just stroll around a bit and to make myself a picture of what is being sold everwhere. So I peaked into one or the other shop smiled a “Ni Hao” to the owner and went on. For me it was important to make a decision things that I would like to purchase beforehand and what money I am willing to spend on it. And that was a good idea because the amount of things that you could choose from was just so vast and would really confuse if you dont have a clear picture in your mind of what you want. What I really wanted was to buy some Pu Erh cakes, a Yixing tea pot, several Gaiwans, a tea table and some gifts for friends. But it was all very new Pu Erh tea from 2014 and 2013 she gave me, but I wanted one that had been aging for some time. So I walked around the store a bit and identified a cake from 2011, which I wanted to taste and that one tasted alright, so I decided on buying it. Price was very reasonable, I bargained from 280 RMB down to 210 RMB, 30EUR. So I was happy. In retrospect I have to say, that I did not know what I was doing whatsoever project methodology agile. Buying a good Pu Erh tea is probably one of the most difficult things in the tea world. There are so many things to consider: Region, Producer, Years of aging, weather conditions of the year the tea was produced, length of the leaves, place of storage etc etc. And in addition to that I was not even able to express the things that I tasted in the tea to the retailer, because I did not speak any Mandarin. And this was what I regretted the most. I was simply not able to share my personal perception of the tea and I was wishing I would actually speak Mandarin. Well, something I have to work on I guess. After that I kept on strolling around a bit more, “Ni Hao” here and “Ni Hao” there and one time I was getting a “Hello” back from a young Chinese girl. I went inside to her and found that she spoke excellent English. This was Zhe Hong. I stayed for at least three hours at Ze Hongs place and drank tea with her. I guessed her to be in her late 20ies and I learned from her, that she used to be working for a shop owner but not long ago realized her dream of an own shop. 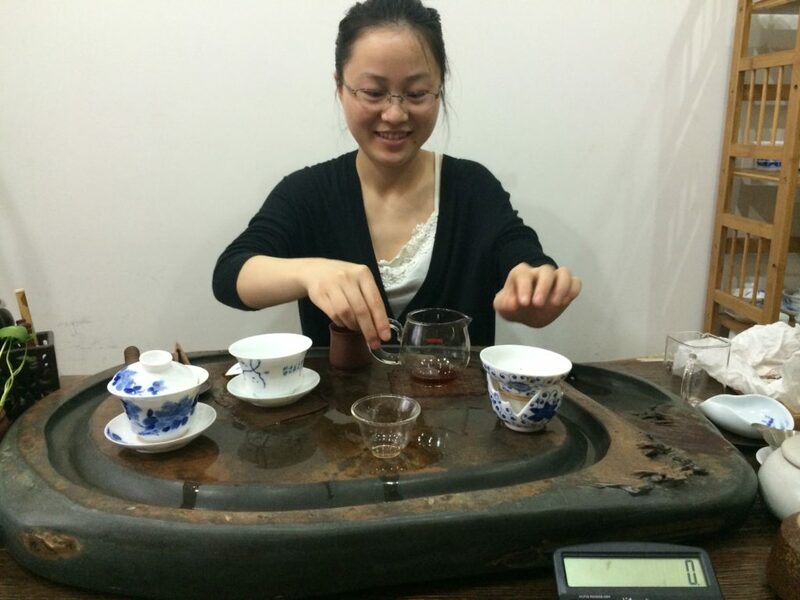 While she is from Anhui and promotes the Lu An Gua Pian (translated Melon Seed) tea from her region, she also partners with a young chap from Yunnan, who is an expert on Pu Erh cakes. I tried both a cooked Pu Erh cake from 2009 and her so much loved Lu An Gu Pian and had to buy both teas from her. Later on two customers from Yunnan would join us and she would work as a translator between the four of us. It was great. And then in her shop it happened, that I had so much tea that I was beginning to feel a bit silly and almost did not find back to her shop after I had gone to the restroom on the other side of the floor, but luckily I managed to get back in the end. Then it was time to close business for me with her and gain back some electrolytes in the form of Xialongbao, Shanghai dumplings, to fight my tea drunkenness. The last purchase I made was a Yixing tea pot and this turned out to be quite a story too. It was towards the end of the day and I was not really up for doing much shopping any more. I was tired from all this excitement of the day and wanted to get it over with. Tea shops began to close down one after another in the mall, but for me it was the last chance to buy a pot, as I would leave China the next day. So I searched around for a tea pot shop that looked interesting and a shop owner I would find likeable from first sight. I found a shop with a middle aged woman with a friendly, warm face and browsed her collection of Yixing teapots. There was one tea pot that caught my attention right away, it was very pretty. I asked her to fill it with water and to pour it out for me. I was pleased with the way it poured and the lid seemed to be fitting very well too, as it stopped pouring when you would press the little opening on the lid. Also the sounds the lid made when I rotated it in the opening was very silent and nice. After that I put the pot upside down on the table and could see that it was perfectly made, each of the three touching points (handle, lid opening, spout) touching the table at once. Then it came to the bargaining, which I lost BIG time. Still I was able to get a little bit off and the price we ended up with was at around 100EUR, which was definitely in the price range I had in mind. I can fully recommend a visit to TianShan tea city to you, even if you are not a tea fanatic. It gives you good insights in the role tea plays for China both culturally and economically and its fun to just browse around and get inspired by the many things tea has to offer you. Great right up. I’m going tomorrow, wish me or my wife that is, luck!